Glasgow prop Euan Murray expects his side to bounce back from their first league defeat of the season when they tackle Bath in Europe. Warriors face the English outfit on Saturday in the European Rugby Champions Cup, with the Scots smarting from their Pro-12 defeat at Ulster. "It was good for the boys to play at that level in that intense atmosphere," Murray told BBC Scotland. "We shot ourselves in the foot at times but we'll park that and look forward." Murray, 34, returned to Glasgow in the summer from Worcester Warriors and is convinced they can mix it with the best in Europe. "Glasgow has changed massively, it's probably the best club I've been involved in," he added. "There's just excellence throughout, it's really good. "We've got the talent and potential, so it's about doing the business on Saturday." 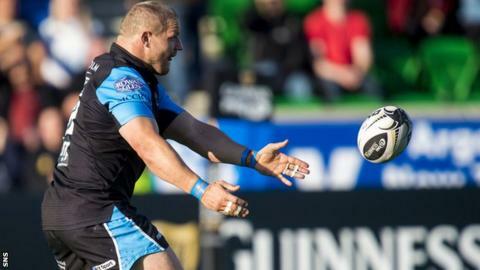 Glasgow's Mark Bennett was carried off in the defeat to Ulster following a tackle by Alan O'Connor, who has now been cited for alleged foul play. "It's always worrying when your team-mate is down for so long but thankfully he's fine," Murray said. Meanwhile, Murray hopes to be involved in Scotland's Autumn internationals against Argentina, New Zealand and Tonga. He may be in the veteran phase of his career, but Murray believes he still has plenty to offer Scotland boss Vern Cotter and would love to be part of the Six Nations squad as well. "I had a few injuries last year so that was really disappointing," he said. "I'd love to play for Scotland and get that elusive victory over the All Blacks. "It's a good line up. I'm glad we're not playing New Zealand first. We're getting a bit of a warm-up, although it will be a really hard game against the Argentinians, as usual. "I'm feeling good and try not to think too much about the age. We've got quite a few experienced guys, a good mixture, with some really good talented young players coming through."